Brina: "Divines [sic] sake, Skald. Who do you think we're threatening with our old war wounds? We're not soldiers, anymore." Skald: "Your man Horik is wearing his old Legion armor. What should I make of that?" Brina: "He's proud of his service, Skald. The Legion taught us loyalty. And we're loyal to Dawnstar." Skald: "This isn't over. I catch you sending one letter to General Tullius, I'll have you both executed." After the argument, the three will return to their normal schedules. Horik wakes up at 8am for a breakfast with Brina. He then leaves the house and follows her around town, pausing at noon and 6pm for one-hour meals. At 8pm they return to her house and spends some time there before going to bed at midnight. 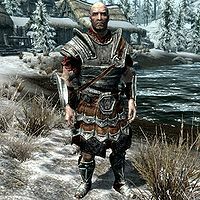 Horik wears a set of Imperial armor, boots, bracers, and shield. In combat he wields an Imperial sword. He also carries clothes, the key to Brina's house, and a selection of middle-class items and gold. When you are near him, he will tell you about what he does: "My duty is to guard Brina Merilis." He'll also warn you to "Watch your hands around the Legate." He also will prove his support for the Empire by saying, "I've been in the Legion all my life. I'm content to serve." Aside from these, however, Horik keeps much of his history to himself. Brina: "You never talk much about yourself, do you Horik? I swear, these past 30 years you've been at my side, and I think I barely know you." Horik: "What's to say? I was born on a farm, joined the Legion when I came of age, and I've served you ever since." Brina: "What about your family? There must have been someone waiting for you back at the farm. Wondering if you were ever coming home?" Horik: "No. Can't say there was. My parents died when I was young. You and the Legion have been my only family since." Brina: "I see. You're a good soldier, Horik. I'm sorry for intruding." Horik: "You weren't. There's just not much to it." "Are you all right? You seem tired." Horik: "Are you all right? You seem tired." Brina: "I'm fine, Horik. I just... are you worried about this war?" Horik: "No. If we must fight, we will, and you will lead us to victory. As you always have." Brina: "With you by my side, is that right Horik?" Horik: "Of course. I would have it no other way." Brina: "So much for old soldiers settling down to a life of luxury, eh?" "No one is getting through us." Brina: "Just like old times, huh Horik? You and me fighting in a war over some forsaken scrap of land." Horik: "Brings back memories. Do you have any orders for me, Legate?" Brina: "Keep the guard alert. I want to make sure no townspeople get hurt if there's trouble." Horik: "Yes, Legate. No one is getting through us." Brina: "Shor's bones, I hope you're right." Horik: "We should go over our strategy again in case the Stormcloaks attack." Brina: "I don't think that's needed, Horik. It's the same strategy we used for every major defense during the Great War. It'll serve just as well now." Horik: "Considering how the Great War ended, I think we need to be cautious about what we rely on." Brina: "Maybe you're right. I guess the battles I won yesterday won't win today's wars." Horik: "I'm sorry, Legate. I didn't want to imply anything about your ability to lead. You're a hero to the Empire, and I...."
Brina: "Oh, don't be such an old stick, Horik. I was joking. I can do that, you know. Redo the battle plans. I'll look over them later." Horik: "I want you to know I don't trust you, Madena. And I'll be watching you." Madena: "I'll tell you the same thing I told Skald. I'm here to help the people of Dawnstar, not play politics. Point your suspicions of treachery elsewhere." Horik: "So you say. We'll see if that's true when the Stormcloaks make their move." Madena: "Well, at the first sign of battle I'll be comfortably sitting in my room, waiting for it to end, so don't you worry." Madena: "I've seen you walking with a bit of pain sometimes, Horik." Madena: "I know old men sometimes have pains in their legs when they rise from bed. I know a few spells that could help." Horik: "I said I'm fine, Madena. I won't have some court mage fixing me up like some magical experiment." Madena: "Still suspicious of me. Well, don't say I never offered." 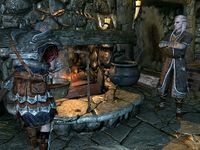 Game data lists Horik's relationship with Brina as lovers, as their relationshiprank is 4. 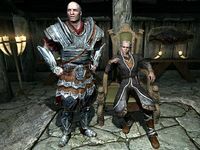 If the Stormcloaks retake Dawnstar from the Imperials, Horik and Brina will be exiled to the Winking Skeever, instead of the Blue Palace like other Imperial-aligned authorities. Horik Halfhand shares the same surname of Rigmor Halfhand in Bloodmoon, the second expansion pack for Morrowind. This page was last modified on 22 May 2018, at 18:18.